Sometimes reliable and low-priced phone service is hard to find. With JoiPhone, at JoiPhone.com, you get both and more. JoiPhone offers an array of calling plans that will fit your needs, as well as add-ons so you can customize your features. JoiPhone uses your broadband Internet connection to send and receive your calls, so you can talk internationally with the comfort of knowing that you are saving a bundle. Go to 58Coupons.com first for the latest in JoiPhone promotions, JoiPhone coupons, and JoiPhone coupon codes. 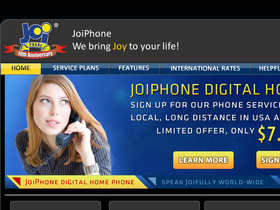 Now at JoiPhone.com, get unlimited calling between JoiPhone customers and 100 free minutes in the US for only $6.95/month. Click link to start. Use this code to get an unlimited phone line from JoiPhone.com for just $8.95 per month. Click link now to save. Take advantage of this deal from JoiPhone.com. Get 2 unlimited phone lines for only $14.95 a month. Click link for more details.